Most people don't think a lot about drilling. Forget the puns about it being a boring subject, people just think that they automatically know how to do it. After all, what could be simpler? You stick the right-sized bit in the drill and you just well, drill. Don't you? Well, no actually! Drilling is a precision subject. Getting the right-sized hole in the right place time and time again is a skill that any woodworker needs. Let's start at the beginning, well not quite with the Greeks when Archimedes had a drill named after him, but in say, Henry VIII's time when the Mary Rose sank. The tool kit found in the ship's carpenter's quarters had a brace and bit in it. You can still buy a brace and bit, but today most people use a battery drill instead of the brace. There, I have jumped 460 years in one sentence. But the point is, the method of turning the drill bit has changed but the bit itself hasn't altered much. Look for example at the auger. Tool historians will beg to differ but I am talking generalities here; I still find it astounding that a Tudor carpenter would recognise most of the tools we use today, as indeed would a Roman chippy. Although augers are still made we don't use them much for precision woodwork. They cut too roughly for cabinet making but are great for plumbers and electricians because the lead-screw pulls them into the wood, but for carpentry they are too coarse. So let's go to the other extreme: metalworker's drills. These are known as jobber's drills or twist drills. They have cutting lips that are ground at 118 degrees which is the best average angle for metalwork. But on timber they tend to skid and can tear the surface where the edges of the drill fail to sever the wood fibres cleanly. These drills are best saved for metals or rough work. What woodworkers need are drills that are halfway between augers and twist bits. They are called lip-and-spur drills. Let's consider how to use this special and accurate cabinet-maker's drill. Where do you want these holes? Holes for screws and dowels are not just random or roughly 'in the middle'. The purpose of screws and dowels is to stop jointed components in the same dimension from sliding apart. The shape that best resists movement is a triangle. Therefore holes for fixings should, if possible, be arranged in a triangular shape. Just look at the pattern of rivets in a steel beam: they are positioned in a series of triangles. So mark your fixing points, in a triangle, but sufficiently far from the edge of the timber not to split it. How far is that? Well I am afraid it varies from timber to timber: the strength of timber is something that you can only learn by trial and error. For photographic clarity I used a combination square to set the precise dimensions from each edge, marking with a sharp, chisel-edged carpenter's pencil so the mark showed up, but normally I would leave only a faint cross. Use a carpenter's awl to make a small dimple where the centre of the hole is to be. My old awl is one of my most used tools! Strangely, several tool companies have started making awls again, including Crown. Don't, by the way, confuse the awl with a bradawl or a gimlet. The dimple provides a hole to seat the point (sometimes known as a brad point) of the lip-and-spur drill. The point will stop the drill skating over the surface. The growth rings on non-tropical timber are alternately hard and soft. If your intended hole fell on a hard growth ring the non-pointed drill would skate away from the hole's intended position. Cabinet makers want accurate holes and that is why these drills are called cabinet-maker's drills. The spurs scribe a clean edge to the hole which allows the cutting lips to chisel out the timber as the drill revolves. The centre point keeps the hole true. That's the basic drilling theory but of course there are a few extra subtleties. Aren't there always! 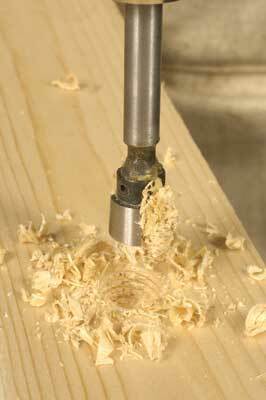 Lip-and-spur drills are only necessary if the edge of the hole is to be seen, as in exposed dowels or plugged holes. For ordinary exposed screws an awl mark and a sharp twist bit will be sufficient. Note the word 'sharp'. Like all tools, drills need sharpening. Reams have been written about drill point sharpening and there isn't space to go into it here. A good rule is to buy your small twist bits up to 5mm diameter in packets of 10, as from Axminster. When you are doing face work take out a new drill. For drills over 5mm buy a spare in each of the sizes you use most and keep these for face work only. Don't let all the drill tips rub together in an old biscuit tin. Buy a proper tin or make a drill stand from a scrap piece of timber with a dedicated hole for each size. Want to drill the perfect hole with no chance of the pilot hole coming out the other side of the timber? What you need is the flat-bottomed Forstner bit which 'peels' the wood. They are most commonly used these days to make the holes for euro-hinges on kitchen cabinet doors. Because of their sharp cutting wings they leave a clean, flat-bottomed hole. Masking tape around the shank serves as a depth guide. One very useful variant is the hinge drill. This is used specifically for centring pilot holes for door hinge screws. These come in sizes appropriate for specific screws and are very useful. Start with a No. 8 size and remember always to clean out the swarf after each use. Long series drills are most useful when you need to drill through one piece of timber into another. A suggested size range is 4, 6, 8 and 10mm. These can be twist bits not lip and spur as you will normally be using these to make a hidden hole and the outer piece of timber will act as a jig. If using a battery-powered drill make sure you set it to the drilling symbol not the screwing setting. For wood you do not need the hammer function; that is for masonry. Hold the drill square to the timber and use a carpenter's square set on edge to give you a guide to verticality. "My old awl is one of my most used tools!" Using a countersink will leave a clean edge around the hole for the screw head to seat into. The method I use to judge how deep the countersink should be is to count, just like a musician does. I use a certain speed and count to six. That usually gives me an adequate countersink for a No. 8 screw. You will need to experiment with your own drills. - Most drills come with keyless chucks. What do you do when the drill bit gets stuck in the wood and comes out of the chuck? The answer is: get your keyed chuck mains drill out of the cupboard because it is indispensable for removing seized drills. Even if the motor is broken you can still grip the drill and twist it out. Don't use Mole grips to remove a stuck drill because you will just chew up the shank!